Context - Over one thousand million people worldwide smoke tobacco. In developed countries, the overall percentage of smokers has decreased, but the percentage is still increasing in developing countries and among women. More and more is known about the harmful effects of tobacco on smokers. Are passive smokers also at risk? 2.1 Tobacco smoking strongly increases the risk of developing cancer of the lung, oral cavity (mouth), pharynx, larynx, oesophagus, pancreas, bladder and renal pelvis (the kidney outlet). It also increases the risk of cancers of the nasal cavities (nose) and sinuses, stomach, liver, kidney, cervix (neck of the uterus) and bone marrow (myeloid leukaemia). In humans, active smoking can cause pregnancy problems, as well as diseases of the respiratory and cardiovascular systems. 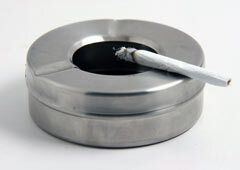 Nicotine is the main component which makes tobacco addictive. Harmful substances from tobacco smoke and their breakdown products are present in the urine and blood stream of both active and passive smokers. In the body, carcinogens from tobacco smoke can bind to blood proteins and to DNA, and can thus produce gene mutations and chromosomal abnormalities. Smoking can also cause changes in the metabolism of cells or tissues, resulting in changes to the way foreign substances are broken down by the body. 8.2 Moreover, there is sufficient evidence to conclude that passive smoking causes lung cancer in humans.